I finished ColdStone today. It took longer than expected to complete this theme due to the release of 2.7, so I am sorry for the delay. You can check out the preview here, as well as the gallery page with a list of features here. As I created this theme I visualized it being used as a business website, so I wanted to include a homepage layout that contained less information that a normal blog, emphasizing the links and giving a basic introduction. However, I have also included 2 other more traditional layouts. Anyone using this theme can choose between a Business, Blog, or Magazine style post layout. The Business-style homepage contains an “About Us” section (which can be edited from within the theme’s options menu) as well as a tabbed menu containing a few common sidebar elements. The Business-style homepage sidebar is also widget ready, so you can add widgets there independently from the main sidebar. 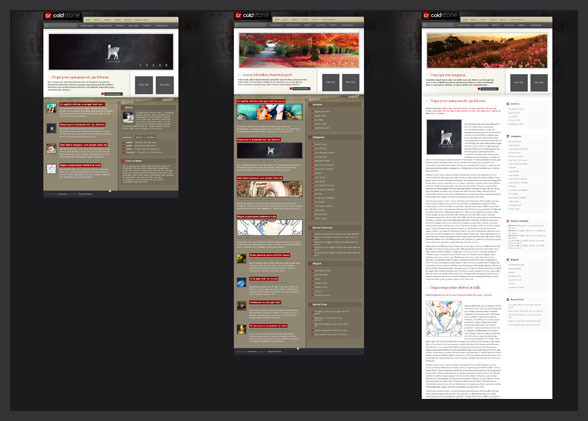 The Blog Style homepage displays posts in full length like a traditional blog, and contains a full sidebar. The Magazine Style homepage is similar to Business-style, however, it includes more posts, no “About Us” section, and in its place includes the main sidebar content. This theme contains three widget ready areas. Widgets can be added to the main sidebar as usual. 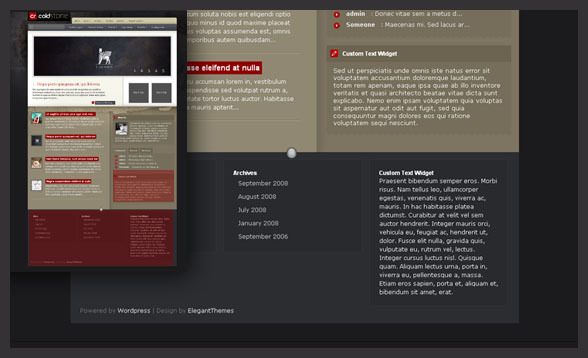 Widgets can also be added to the footer, as well as the Business-style homepage sidebar. This theme includes multi-tier dropdown menus for pages and categories. As usual, this theme utilizes timthumb.php to automatically resize all thumbnail images. Only one source image is require per post, unless the post is being featured. ColdStone comes with 2 predefined ad areas. You can add a single 468×60 banner add to the bottom of all post pages, and 2 125×125 banners to all pages. These ads are all managed from within the theme’s options menu. The theme comes compatible with 2.7, and includes threaded comments integration. finally, the waitng is over!! Nice…going to install this soon. I love the drop down menu! Could you not have had the blogstyle, something the same as the business style? With the same bg etc.. Instead of just white ? I for one am glad he left it white. There isn’t any options to have the feature header auto scroll, is there? It has been a loooong time but it was worth waiting – love it! GREAT!. Thank ou so much! Merry Christmas to All! An specially for Nick. Keep on the good Work! This is a great theme. The search box is showing a yellow box in Firefox. Everything looks good in IE. Doesn’t look yellow in FF to me. Might be your Google toolbar or whatever toolbar it is that offers to auto fill your forms all the time. Just amazing…Exactly what I needed! An excellent example of this theme could be found in my site ^_^… just click my name to go to it..
why you remove the credits to elegant themes. Amazing theme! Really excellent work. I’m very impressed. Your use of superfish for dropdowns gets better with every theme! I love the way these blend into the theme, it really is just perfect. I would say, for a dark, cool, businessy theme, you can’t get any better. Merry Xmas to all elegantthemes club members ! Hell of a theme! In fact, I’ve loved almost all of them. The only thing holding me back from purchasing is I haven’t had time to install new themes. For 20 bucks though, it is a no brainer. Nick, the theme is great…just one thing, you may need to check the theme in IE as it seems to have some error in Internet Explorer. never mind, i think the error accured coz there was not yet an “featured article” posted…now its fine :-)…sory for the confusion. Really nice theme…clean and elegant like the rest of them. Hope to buy it soon for one of my new project. Keep up the good work ! I was hoping you’d do a text based theme soon and I would hold out for that but this theme has sold me on finding images for all my old posts, well at least all the good ones. Any reason you put in 124×124 ads? Shouldn’t that be 125? Actually they are 125×125, that is a typo. Oops! Ha a little late night themeing? 🙂 We’ve all been there! I got mine up and running … some old content is still missing which I have to transfer from my old webspace, other than this I’m just lovin’ it ! Merry Xmas for ya all ! EXCELLENT theme. However, check out the drop down navigation in IE6… PNG fix for that? they only require link back. I wonder if you are able to provide the fonts for the logo. Best theme for my Blogs. Yes it is possible. Please make a thread on the support forums and I will outline the process. how do you add pictures to post so they can show is the main display? This is explained in the readme file that came with the theme. If you have any problems please use the member support forums. Also if i buy it would it be possible to make some very simple modifications about colors in order to make it fit our company design chart ? When you create a page/category you can assign it to a “Parent” page/category. All Children pages are displayed in a dropdown menu below all Parent pages. You need to install the plugins that came with the theme. In the future please use the support forum for tech support. Is it possible to automatic change featured articles on home page? Most of the visitors see only first image, they don’t see those numbers of featured articles. 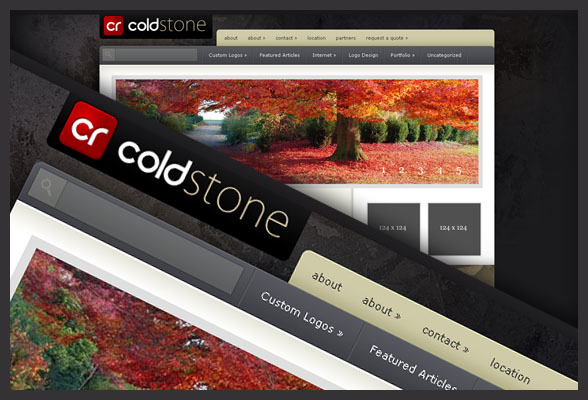 I have seen many WordPress themes and ColdStone is definitely in my top 5 designs! Out of pure curiosity, is it possible to have embedded script in either the content rotator or the ads? For example, embedding an 800-by-350 (or there-about) widescreen video in the rotator? and does the rotator rotate automatically? Just like to say this is a GREAT design! Actually, all of your designs are awesome & by far the best out all the umpteen million blog designs I have seen, with ColdStone being my favorite. Looking forward to using this as my blog design soon as I’m still working on my website. Ironically, my site & this blog share SOME of the same design aspects so its going to work out great. Thanks for the awesome designs & looking forward to joining soon along with the new updates you got going on. I have installed this theme, looks great. I know that we should click at general setting and choose featured article to show. I came across this theme and am interested in migrating my current blog to this theme, but I’m worried about the image resizing. My site (click name to view) is fairly image heavy and I’m worried about the images not sizing properly. Could someone perhaps confirm how the process works & explain how I would not end up with horribly distorted images? Also, to what extent is the theme customisable? I’d like to get rid of the ‘grungy’ background and have a cleaner look (white background perhaps). I’d also prefer to edit the red border around titles under the fold and make sure the headlines displayed in full rather than cutting off half way. Is all that possible to execute? Pending some answers I would be keen to purchase. How do I change links of featured articles. That is pointing to pages/posts of my choice. What is the font name, used in the logo? Very interesting. Can I use any of your theme to my blogspot? Please response. I like the theme a lot, but deperately need to be able to auto-rotate the featured images/articles. It would also be nice to be able to auto-rotate the two square ad spaces just below and to the the right of the featured image area. Can you advise a way to do this or are you planning an update to the them that will include these features? @Doug – Did you ever find the answer to your question about auto-rotating the featured images/articles? I’d really like to do this as well… Thx. Totally awesome theme! Way to go guys! I am facing problem in displaying image of featured article on the Home page. Just set a featured image for the post. 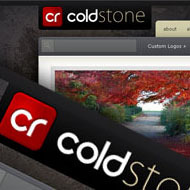 I really like the Coldstone theme and I am thinking of using it for my company, but I noticed in IE9 there are some spacing issues on the home page and it is messing up the images. Seems fine in all other browsers. Someone changed my site over to WordPress with the ColdStone Elegant theme because I wanted this type of menu.. Is there any chance this has been updated for the Responsive Mobile? I really don’t know much about wordpress.. But, I am being told, I have to get ready for mobile, and I am sure this means loosing the menu system I wanted..